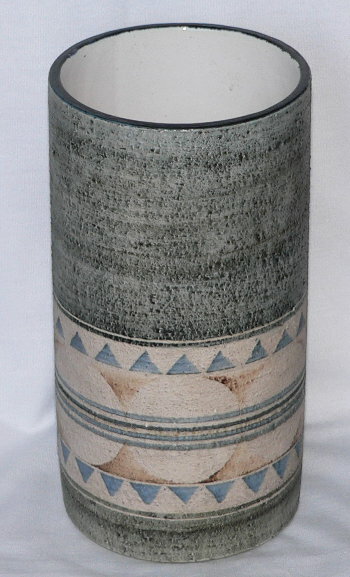 This Troika vase stands approximately 19cm tall and is beautifully decorated by Avril Bennet who worked at the Cornish pottery when it was based in Newlyn, in Cornwall, England, from c1973-1979. If you’re looking for a Mother’s Day gift then this vase would be perfect – it can be for decorative use or would look brilliant with daffodils in! If you’re still searching for that perfect Mother’s Day present then check out our full stock page to see every piece of pottery for sale – this will make it super easy to find that perfect gift! This entry was posted in New Stock and tagged Avril Bennet, Mother's Day, Troika, Troika Pottery on March 3, 2015 by Perfect Pieces.